LEO Weekly (Louisville, Ken.) 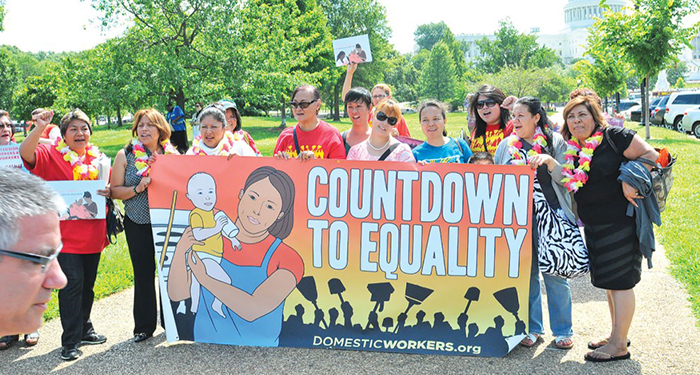 cites a 2012 study on domestic workers by the Center for Urban Economic Development in the College of Urban Planning and Public Affairs, calling it “the most comprehensive resource for issues plaguing domestic workers in the 21st century” and urging at the federal and state levels. In 2012, The NDWA and the University of Illinois in Chicago published “Home Economics: The Invisible and Unregulated World of Domestic Work.” Based on surveys from over 2,000 domestic workers, it is the most comprehensive resource for issues plaguing domestic workers in the 21st century. The findings show the necessity for reform at both the federal and state level. The survey’s findings told the country what many already knew: domestic workers face disproportionate levels of exploitation and wage theft. For example, 23 percent of domestic workers who were surveyed earned less than minimum wage; for live-in workers, the number rose to 67 percent.